The game itself is a mystery story based around solving quick(ish) puzzles. Professor Layton gets a letter from a woman named Dahlia asking him to help her find her late husband's treasure, the Golden Apple. So, he and his young apprentice, Luke (wait, when do Professors have apprentices? ), head off to the (curious) village to solve this mystery. 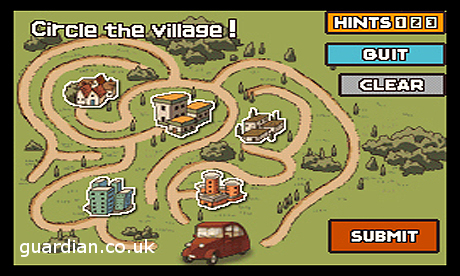 Of course, the first puzzle is finding the village. Basically, you have to pick out the only village that doesn't share a road with any other villages. 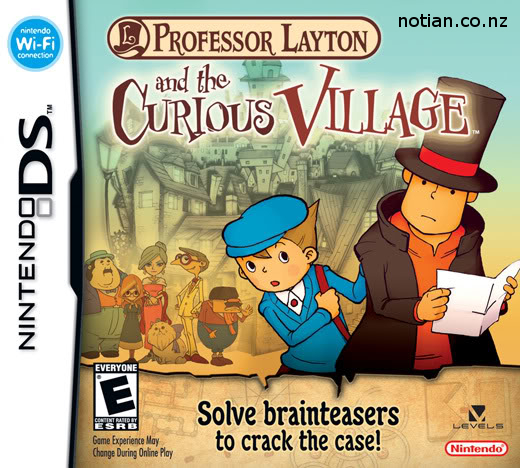 If you can solve this puzzle, then you're ready for Professor Layton. The story itself is pretty standard, and I managed to figure out the major plot twist fairly early in the story. The main point (as I stated earlier) is to solve many little puzzles. The puzzles are challenging without being overly difficult, though the introduction of them is a little sloppy (usually along the lines of, "Hey, you, guy I don't know, help me with this puzzle!"). It took me until a little more than halfway through the game to get into the rhythm of solving puzzles (puzzles and brain teasers aren't exactly my strong point). Not bad for a DS game, right? A little bit of goofiness aside, the game was quite enjoyable. So much so that I went ahead and bought the second game. I'm almost finished with that as well. So, if you haven't played this game yet, you really should; it's a whole lot of puzzling fun.